Hello, my name is Paytre Romanoff. INZARED, that’s my wife, is the elephant rider with the Romanoff Brothers Circus. She’s really good at what she does but it wasn’t always that way. There were a few times I thought she’d fall straight off the elephant (his name’s Cecil). She wouldn’t have escaped without a lot of injuries if she had. All I’ve ever known is the circus. My parents came over from Romania toting a young bull elephant my Father had bought and raised. The owner was all for killing the elephant – the mother died in childbirth, but my Father convinced him to let him buy the baby bull and he nursed it along. Sometimes Cecil thinks he’s a person. I used to sleep with him when I was little. My mother said I’d curl right up in the hay and Cecil watched over me. I love that wrinkled skin and his eyes. They look so wise – like he’s been around for generations. He’s always been easy to handle. Of course, he’s never known anything but love and my Father trained him when he was still very young. But as much as I love him, it’s magic to watch him with Inzared. The two of them have something very special together. It’s almost as if one can sense what the other is going to do before they even think about it. The first time I met Inzared she was still Bertha Maude Anderson, a girl from Brower’s Gap, North Carolina. She and her folks lived high in the Appalachian Mountains. The circus hadn’t planned to go there at all, but I’m sure glad we did. Shandor and Udo (the brothers who own the touring show) made the decision to swing over to Brower’s Gap and a couple of the surrounding towns when a some other performances fell through. We have to work. If we don’t we can’t keep doing what we do. You see, I come from a long line of circus performers. People get the wrong impression sometimes about us Gypsies. I’ve been spat at, punched, and generally mistreated by some Gajii who think we’re ruffians. We aren’t. We’re nomads, that’s all. We like to keep moving and are happiest on the road in our vardo, sitting around the campfire every night making music and dancing. We don’t cause anyone harm. All we want to do is perform our shows, make a little money to get through the lean winter months and move on. I have to say that I caused my wife some real heartache. It wasn’t ever my intent. But the minute I set eyes on that black hair and her sparkling eyes I was hooked. She came looking for me at first. She said her Pa let her seek the elephant act out. She came into view and I froze. I couldn’t think of a single thing to say for a minute. and I persuaded her to come back one more time before we headed out of town. The rest is history. I didn’t really intend for her to leave with us. But Mala, who was riding Cecil in the show, became unable to ride due to an old injury. I’d just given Bertha a ride on the elephant when I knew no one would be looking. She was a natural. So when Shandor came to me frantic about Mala’s injury and having no one to ride, I suggested Bertha. Of course, he said no right away. We don’t use Gajii in our shows. We don’t even spend time with them. But Bertha was different. She looked as Gypsy as I do, with skin tanned from long hours in the fields and that jet-black hair. She has an exotic look about her and she is totally unafraid to try just about anything. Shandor didn’t have much choice. It was either use Bertha or omit the elephant performance and that would have been a catastrophe. And it worked. Shandor is actually the one who gave Bertha the name of Inzared. It means “Queen” in our language. He meant it as a jab, but she didn’t even notice, she was so excited. That’s another thing I love about my wife. All she wants is to see the world, have a little excitement, and she’s pleased with anything people give her or do for her. She was elated – thought it was the most beautiful-sounding name she had ever heard. And from that day on she refused to be called anything else. When we finished that first performance I kissed that girl right on the lips. I had a feeling that I’d marry her, right from the start. We just belonged together. I was the one who enticed her to leave with us that very night. Shandor was skeptical, but Inzared told a little white lie – said she was adopted – and he gave in. She was a little scared but she was a real trooper. Inzared was sad sometimes, though. She always missed her home, even though her parents weren’t all that understanding. She felt that she owed it to them to let them know she was leaving, I guess. Some nights I’d find her crying and all I could do was put my arms around her while she cried. But the next morning she’d go right back to work. She and Cecil concocted some pretty unusual and exciting acts to perform in the ring. 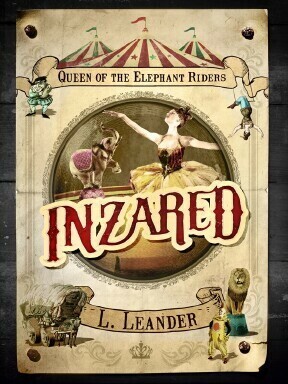 It wasn’t long before the circus was making good money and all because of INZARED, Queen of the Elephant Riders. One of the biggest problems Inzared faced was some of my relatives. We’re all related here – brothers, aunts, cousins, but she was an outsider and a Gajii, to boot. A few people treated her with disrespect but she tried to make everyone like her. I’ve never seen a girl work so hard. It wasn’t fair for others to treat her that way, but eventually most of them changed their minds. It’s been great talking to you but I really have to take care of Cecil. We’ve got a show to do tonight and I’ve got to get him ready. Maybe you could by come another time and we’ll talk some more? If Inzared is here I’d love to introduce her. I’m sure you’ll love her as much as I do – she’s a one-of-a-kind woman! 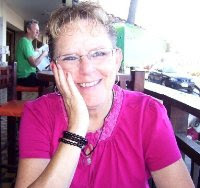 L.Leander is an author who lives in Wisconsin with her husband, Ralph, during the summer months but spends the majority of the year in Mazatlan, Mexico. Ms. Leander is an award-winning singer/songwriter who has also won awards for her needle arts. As a child, Ms. Leander loved the circus, hence, her debut novel, INZARED Queen of the Elephant Riders. The book follows the adventures of an Appalachian girl in 1843 who runs away to join a Gypsy circus and becomes a famous elephant rider. The views, beliefs, and opinions expressed by guest post authors are their own and do not necessarily reflect the views, beliefs, or opinions of Girl Who Reads. Girl Who Reads is an advertising affiliate with Amazon and IndieBound; a small fee is earned when purchases are made using the above links.